The rollicking heist movie is one of those genres that can easily feel redundant nowadays. With elaborate plot machinations its central tenet, this specialist variety of thriller relies on having an original way to dupe its audience who will naturally be looking for clues towards some final act twist. 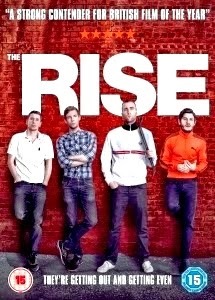 Trying to find a unique spin on the material is director Rowan Athale, who brings to DVD and Blu-ray his debut feature in the form of 2012 British crime caper The Rise (formerly Wasteland). Whilst it’s hurtling pace means it rarely bores, it is ultimately unable to find any innovation within the genre trappings and viewers will be far from fooled. Brutally beaten yet surprisingly smug hipster Harvey (rising star Luke Treadaway) sits in a police station as he’s questioned by Detective Inspector West (Timothy Spall). Charged with robbery, GBH and only six weeks after serving a prison sentence, things don’t look good for our protagonist, who’s subsequently coerced into telling his story in a device unsubtly drawing on a scenario familiar to one Verbal Kint. Harvey recounts a tale of being released after a year inside, hungry for revenge against local drug-dealer Steven (Neil Maskell), the man who stitched him up. Together with his three friends (Iwan Rheon, Matthew Lewis and Gerard Kearns) an exceptionally convoluted robbery is meticulously planned to get back at slippery Steven. Sadly, we always know how wrong things will go and we’re fully prepared for how Harvey’s run-in with the police will end up. That is the major problem with The Rise; its insanely intricate plot would be fantastic if it was actually as clever as it – or its protagonist – thinks it was. The film is stylishly put together and the performances from the supporting cast are good with Maskell genuinely threatening as the local dealer and the three friends giving Treadaway able backup and comic relief. Unfortunately, Harvey is not the most likeable of protagonists and so it’s difficult to fully back his scheme for any more reason than we’d prefer his friends, who he’s dragged along for the ride, not to die. Whilst it does well at keeping the viewer engaged for the most part, Athale’s The Rise is ultimately let down by its uninspiring lead character, its convoluted scheme and final revelations that are never quite smart enough to confound an audience nor live up to their mastermind’s own high opinion. This review was first published on 16 October, 2012 as part of our London Film Festival coverage.